Prevent tampering with vital equipment and inventory. 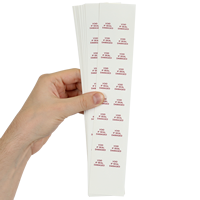 These destructible calibration labels are built to break apart when tampered with, as soon as they are fully adhered to an object. • Write on this destructible vinyl material using a pencil, typewriter or ball-point pen. These labels are made from destructible cast vinyl. 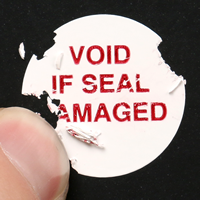 • TheftGuard® labels are "frangible", designed to break apart to prevent tampering on your valued equipment. • Labels are screen printed for extra visibility; labels are designed to break apart when tampered with, only when they are fully adhered to an object. Easy to handle and they leave an obvious mark when torn. I bought these for securing a micro-SD card within an embedded product. Wish they were a tad smaller, but should do the job fine. Labels look great and delivered as advertised! These work Great! Others I ordered would not tear off the sheet and others did not stick well, but yours work. Thank you. Exactly as presented. Works great for the intended purpose. Tested one and was amazed how well they work. NO WAY to get it off or through it without destroying it!